Mézerolles is a village and commune 8 kilometres west north west of the small town of Doullens, which is on the main road from Amiens to St. Pol (N.16) about 30 kilometres north of Amiens. The village is on the N.338 road from Doullens to Auxi-le-Château. The communal cemetery is south-east of the village in a by-road leading from the N.338 road. Near the south-eastern corner are the graves of six airmen, five of whom belong to the Royal Air Force and one to the Royal Canadian Air Force. Incident: Crashed at Mézerolles, Somme. Sgt. H. M. McAllister was taken prisoner. Son of Tom and Serrena Pugh, of St.Jean sur Richelieu, Province of Quebec, Canada. 1382421 Flight Sergeant Phillip Heriot Armstrong, Wireless Operator in 77 Squadron, Royal Air Force Volunteer Reserve, died 15th March 1944. 1800713 Flight Sergeant Douglas Arthur Cole, Navigator in 77 Squadron, Royal Air Force Volunteer Reserve, died 15th March 1944, aged 20. Son of Arthur and Alice Catherine Cole of Sittingbourne, Kent. INSCRIPTION. UNTIL THE STARS FORGET TO SHINE WE WILL REMEMBER HIM. SADLY MISSED. 1324959 Flight Sergeant Henry Oliver Hill, Air Gunner in 77 Squadron, Royal Air Force Volunteer Reserve, died 15th March 1944, aged 22. Son of Henry and Rose Hill of Plymouth. INSCRIPTION. DEAR SON OF OURS, FOR EVER YOU WILL BE ENSHRINED IN OUR HEARTS A SWEET MEMORY. 130968 Flight Lieutenant Ronald George Spicer, Pilot in 77 Squadron, Royal Air Force Volunteer Reserve, died 15th March 1944. 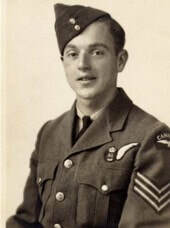 1318181 Flight Sergeant John Albert Taylor, Air Bomber in 77 Squadron, Royal Air Force Volunteer Reserve, died 15th March 1944 aged 21. Son of Percival Henry and Mabel Agnes Taylor of Letchworth, Hertfordshire.